Santorini is a Greek volcanic island in the Aegean Sea. The island is known for its stunning beauty and vibrant nightlife, two qualities that make it the perfect place for any type of holiday! Around the lovely white streets of Fira – Santorini’s capital city – you’ll discover delicious food, cute shops and enjoy the sunset views over a glass of wine from one of the many terraces. If you like hiking, the walk from Fira to Oia is BEAUTIFUL, with impressive views of the sea from above. Another option for nature lovers is climbing up the volcano that created Santorini in Nea Kameni island (you can get there easily by boat!). If you want to escape the tourists, read this article for the best things to do Santorini! The best hostels in Santorini are spread out all around the island, including Fira, Perissa and Karterados. 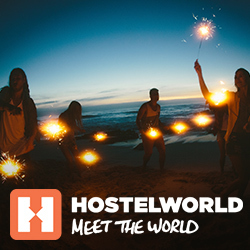 Now, tell us your type of holiday and we’ll tell you your hostel! Being a solo adventurer, you might be longing for a hostel with daily activities and a great social atmosphere. Does this sound like it’s up your street? Then check out these hostels in Santorini! Are you looking for social vibes and daily activities? A central location in Fira? Do you need friendly local’s insider tips? Look no further! The hostel perks also include a small swimming pool, a complete kitchen and a chillout space on the terrace. You can catch the bus at the stop right outside the hostel door, although Fira is such a lively city you’ll rarely want to leave! Steps away from Perissa beach (popular for its unusual black sand), you will find this cheerful hostel, where there’s always something fun going on – solo travellers will make friends in no time! If you need help to explore the island, the hostel will provide you with maps and tips. Imagine sleeping in clouds. Now look at the picture above. Not much difference, uh? Besides the free breakfast, I mean . This renewed 18th century winery with white rooms and a shabby-chic style provides a great relaxing yet social experience! Hang out in the cosy lounge areas and the colourful gardens to meet likeminded travellers. They say swimming in the sea is the best cure for hangover! Maybe that’s why all our party hostels in Santorini are on Perissa Beach. Or maybe it’s because of the number of great bars in the area. In any case, you should stay in one of these hostels if you are looking for big nights! With an outdoor bar, a swimming pool and an incredible vibe, the parties in this hostel are even better than its price. It’s conveniently located in Perissa Beach, surrounded by plenty of bars and clubs! You’ll also be 5 minutes away from a stunning black sand beach. If you’re looking for parties, we’ve got you covered. The bar by the pool is the perfect place to meet other backpackers – and it’s open until late! As we already said, you’ll be in an area full of bars and clubs, as well as a few meters away from the beach. But if you want to explore other parts of the island, the bus that will take you EVERYWHERE in Santorini is very close to the hostel! Everything ready for Santorini? We hope this guide helped you to find the perfect hostel in Santorini. Did you already stay in one of these hostels? Share your experience in Santorini and help other travellers to have a wonderful trip!